Nearly all diamonds have physical characteristics present on or in the diamond called inclusions. These inclusions can be clear (bubble-like), black, white, and even cloudy-like. There are internally flawless diamonds, but they are very rare and costly. The smaller the inclusions, the higher the clarity, and the more rare and valuable the diamond becomes. The inclusions give a “fingerprint” of the diamond and no other diamond will share the same “fingerprint”. 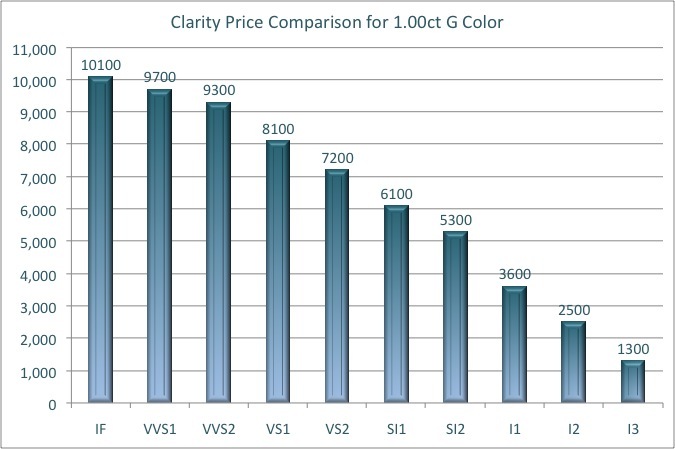 Choosing a specific clarity is really a matter of preference and your decision may be easier once you view some sample pictures below. The GIA (Gemological Institute of America) clarity scale is the most widely used to describe clarity of diamonds. Listed in order from no inclusions under 10x power magnification to eye visible inclusions below. An extremely rare 100.10-ct. D-color Internally Flawless, pear-shaped diamond was sold by Sotheby’s in 1995 for $16,548,750.00 US. That’s about $165,322.00 US per carat. How does diamond clarity affect sparkle, fire and brilliance? The more and or bigger the inclusions, the more light is absorbed and not reflected back to your eyes. So there is less sparkle, fire, and brilliance. So what should you buy? Well it depends what type of jewellery piece you are buying…. an engagement ring, earrings, pendant, etc. For engagement rings we find most people should go no lower than a SI2 clarity grade, unless it’s an I1 that can be mostly covered by a claw or part of the setting. For the average person looking at your diamond with the naked eye, it will not be possible to see the difference between a flawless diamond and a VS2. Below are several samples of 1.00ct diamonds which show examples of the different diamond clarity grades. Click the clarity to view the picture. Clarity grades VVS1 and IF (internally flawless) can not be picked up by our camera. 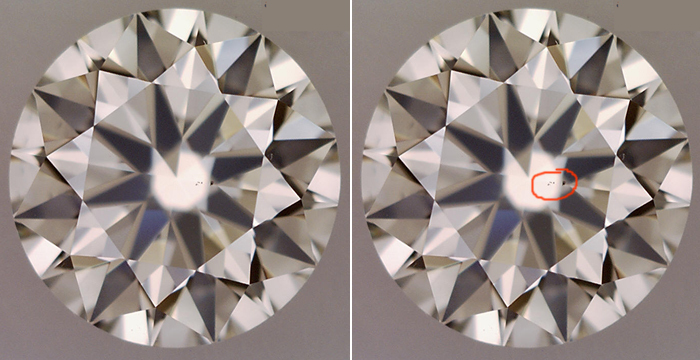 The illustration below shows how the diamond clarity affects the value of a diamond with the color, cut, and carat weight being equal. This graph is based on a 1 ct diamond, G color and an Ideal Cut. There is between a 5-33% difference for each step in clarity depending on which clarity is being compared. Why the difference? The higher the clarity the more rare it is, the more valuable it becomes.